Red Creek Fir - From the Genus Pseudotsuga menziesii, Port Renfrew contains the largest one in the entire world, it is an exciting off road drive. Well worth the visit, be wary of extreme driving conditions, steep cliffs. narrow bridges, and deep washouts. Fairy Lake campground and hiking trail - Located three kilometers from Port Renfrew, Fairy lake is a tidally affected fresh water lake which feeds directly from and into the San Juan river and estuary. An excellent fishing spot, it is not unusual to see anglers out in the early mormning and evenings trying their luck for Cutthroat Trout and Dolly Varden, and returning Salmon. Giant Spruce - This region is home to some of the world's largest spruce trees, some reaching heights in excess of 95 meters and living for 800 years or more. This large Sitka spruce ecosystem represents 2% of BC's remaining old-growth forest. 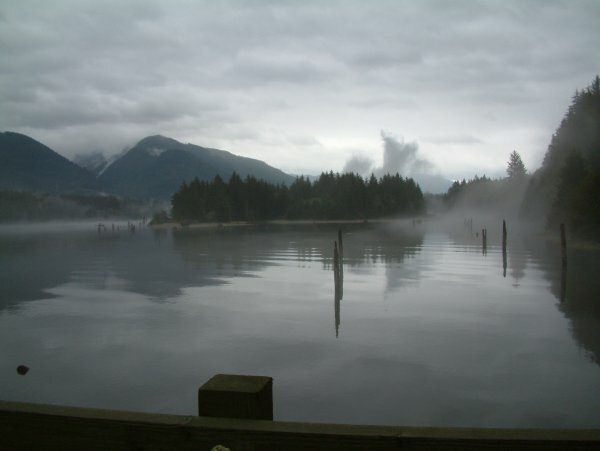 Sitka spruce, are tolerant of ocean derived salt spray, and edge the coastline of the island. The spruce also require a porous and moist soil, and are prevalent along the flood plains of creeks and rivers. Juan De Fuca Marine Trail - Not Enought time to hike the west coast trail ? The Juan de Fuca marine trail offers much of the same rugged beauty as the west coast trail without the transprotation and reservation issues involved with hiking the West Coast Trail. Easily accessible by car along many points of the West coast road, it is perfect for day hikes, and weekend adventures. Botanical Beach - Easily one of the most popular attractions in Port Renfrew, it is estimated that 500 000 people a year travel here to see the rugged shoreline, and tidal pool wonders of Botanical Beach. Botanical Beach affords visitors with access to uniquely rich tide pools and shoreline trails with fantastic geological features. The extensive variety of marine flora and fauna in this colourful intertidal zone includes red, purple and orange starfish and sea urchins, white gooseneck barnacles, blue mussels and green sea anemones and sea cucumbers. Coralline algae, periwinkles, chitons and sea stars can also be seen at Botanical Beach. The region is so biologically significant that the University of Minnesota installed the first marine research station in the Pacific Northwest at Botanical Beach in 1901. Since then, the area has been used for research by a number of universities in BC and Washington. Roosevelt Elk - In 1993, the Ministry of Environment transplanted a herd of Roosevelt Elk cows and calves to the San Juan Valley. Long ago a historic range for elk, they had not lived here for many years. Since their re-introduction, there are frequent sightings and hoof prints in surrounding areas and trails especially along the San Juan river estuary. There are at least three herds now. Young bull calfs show first year antler growth from May through September, with single spikes from 10 to 24 inches long. Always a pleasure to spot them, look for them along the river banks near sunset and early morning.